Networking can be unnerving for recent college graduates and new professionals, but it’s essential in landing a new job and career growth in the future. It’s estimated that at least 70 percent of available jobs are never listed online. Attending industry events, conferences, and other networking opportunities is a great way to get your name out there and discover jobs that aren’t posted on online job boards. With that in mind, here are five tips for recent college grads to network like pros in any networking situation. Having confidence is easier said than done, especially in an unfamiliar situation. The best advice to appear confident when you aren’t is to “fake it till you make it”. You can give the appearance of confidence by being conscious of your body language. Studies have shown that those who stand in “power poses” command more attention, suffer less stress, and benefit from improved performance. Make sure to stand with good posture, keep a smile on your face, and nail down the perfect handshake in order to impress a prospective connection. Many people subconsciously correlate appearance with competence in other areas. This makes it essential to have a well-rounded professional image. How you appear and what you wear can embolden you to feel more confident and improve the way you interface with others. Paying attention to little grooming details prior to a networking event can give you an added polish and confidence boost. You can utilize a variety of effective beauty solutions to manage hair loss, smooth out your complexion, and whiten your smile. For sustainable improvements in your appearance, make sure to practice regular self-care by exercising regularly, sticking to a sleep schedule, and keeping a balanced diet. When considering an outfit, you should always match the dress code of the event you’re attending. However, if the dress code is unclear, you should dress to fit the role of the position you’re aiming for. Looking the part doesn’t just impress your potential connections, it enables you to act the part as well. Everyone likes to talk about themselves. After introducing yourself, actively engage with your new connection and ask them about their experiences within the industry. Stay present in the conversation without checking your phone, speaking over them, or scoping out the event for who you want to talk to next. Demonstrating your interest in the work they’re doing makes them feel important while showing them your passion for the industry. Finding common ground and mutual interests can solidify a memorable conversation. You don’t want to go off topic without reason, as it can make you seem like you’re not serious about your industry. However, if a conversation is going well, don’t be afraid to test the waters around more personal topics, such as a favorite sports team, television show, or recent movie. After a good conversation, you should always remember to get your new connection’s contact information to follow up after the event. This way, you can continue to build on your new professional relationship. Offer your own contact information and/or business card as well. These tips are sure to get you noticed and remembered at your next networking event! 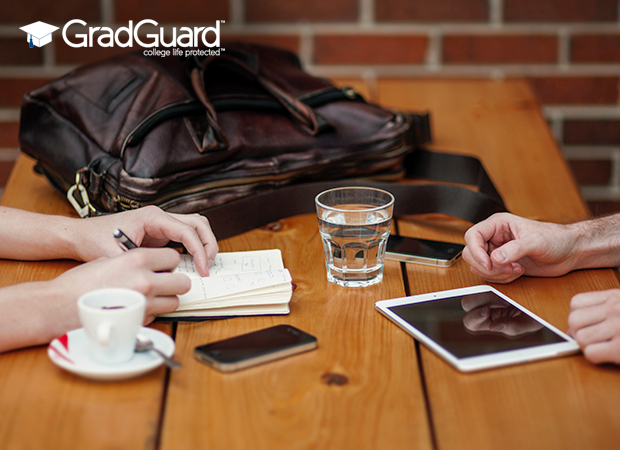 Don’t forget to follow GradGuard on social media if you enjoy posts like this one.